Mangrove trees support a unique ecosystem in Phang Nga Bay, one that is like few others in the world. Few other plants can survive in the area, and thus the mangroves provide most of the shelter and nutrition that allows other species to thrive. The final result is one of the most striking systems in nature, one that can be both enjoyed and understood by anyone who loves the natural world. Mangrove trees are one of the few plants that can survive in brackish water. Most plants in that type of environment will absorb too much salt, which causes them to get dehydrated and die. Mangroves solve that problem with a sap in their roots, which is called suberin. It allows the mangrove to filter out salt from the water as it absorbs it and determine where the salt and water move through the plant. The water goes inwards and keeps the mangrove hydrated, while the salt gets concentrated in old bark and leaves. The tree then excretes the salt back into the environment. That system is a triumph of nature, which proves just how far life can go to adapt and thrive! Mangrove roots are also incredible survival tools. Some mangroves have roots that can act like stilts to prop them up out of the water. Those roots have pores in the bark, and the tree uses the pores to absorb air, while the parts that reach the soil absorb nutrients from it just like with other trees. The roots can even store air, so that the tree can process it when the high tide is covering it! Their seeds are the last part of the puzzle that makes the trees thrive in a rough environment. Most plants have seeds that only start to grow once they get in the ground. Mangroves break that trend. Their seeds will germinate while they are still on the plant, which gives them the strength they need to survive. Once the seed develops, the tree will drop into the water. The seeds can float, so they will keep drifting until they end up in a place that can support a new mangrove tree. Water and soil rarely get along. The current naturally breaks up the soil and causes it to drift away. That erosion can radically change an environment, which makes it hard for most species to survive in that area if they need anything from the land. Mangroves are a vital part of the ecosystem because they can prevent that process from happening. A mangrove's roots will dig deep into the soil, and act as a sort of anchor that holds it in place. A single root does not do very much, but a whole forest of mangroves can easy create a tight web of roots. That structure acts like a net that holds the soil in place even as the water pushes against it. The roots can also dissipate energy from waves and the tide, which reduces the force that can move the soil. Some of the soil will keep moving, but most of it will stay in place, and even accumulate nutrients that are floating in the water. Almost every species in the mangrove ecosystem benefits from this process. The trees get a chance to collect nutrients from the soil. Animals get a stable environment where they can live. Some even live among the roots themselves! 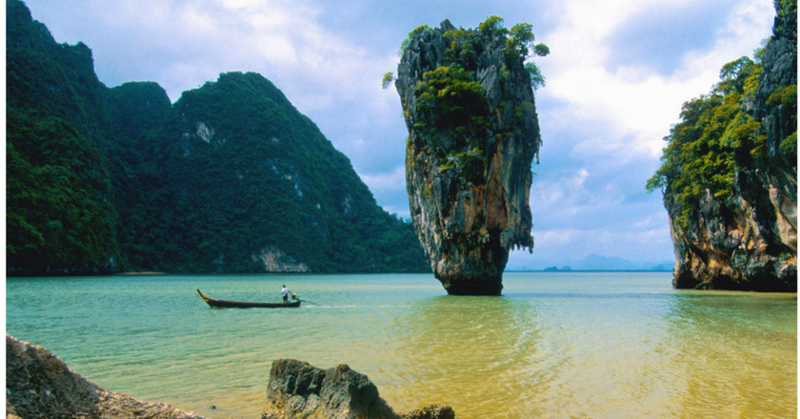 The water is home to the vast majority of life in Phang Nga Bay. The aquatic food chain starts with debris from the mangrove trees. Old bark and leaves fall into the water, where they form a layer of nutritious sediment. That provides nutrients for several species and helps algae to grow, which feeds snails. Larger crustaceans, such as the striking Fiddler Crab, also feed on the algae. They can be seen in huge numbers when the tide is out, and they form a valuable source of food for the larger creatures in the area. Fish form the next few links in the chain. Some of them, such as mullet, will eat the leaves and other sediment that fall into the water. Others eat crustaceans, or smaller fish in the bay. The little fish will hide among the mangrove roots to avoid the bigger fish. The entire area is sheltered, so all of the fish use it as their breeding grounds. That means that the mangrove ecosystem is vital for maintaining healthy fish populations in other areas. Many of those fish are popular with fishermen, which makes the area vital for supporting human activities as well. Phang Nga bay is teeming with fish and other aquatic life, but there is also plenty of action above the water. Herons, egrets, and other species that feed on fish live among the mangroves because they can always find plenty of food in the area. This type of environment is great for birdwatchers, since there are more than 200 bird species living in the mangrove forests of Thailand! Bats are also common. Flying foxes, or fruit bats, are the most important of those species. They feed on the fruit that grows in the area, and they also serve as pollinators for many of the trees. Some species also use other pollinators, but the bats are the only option for many species. If the bats ever ran into trouble, those plants would quickly die out as they failed to reproduce. Fortunately, the mangrove trees provide a safe environment for the bats to live and multiply. Even monkeys can find a place to live in a mangrove forest! Crab-eating macaques devour the crustaceans when they get them, but they will also eat plants and almost anything else that they can find. Otters occasionally compete with them for the crabs, so it is a good thing they can get other sources of food! One creature that tends to be rarer than people expect in this area is the humble mosquito. They struggle to lay their eggs anywhere outside of the intertidal zone at the edge of the forest. Some of them do get in, especially in places where humans have littered, but there are plenty of birds in the area that love to eat them. Mosquitoes certainly do show up in the area from time to time, but the population stays fairly low, so they remain a simple part of the ecosystem rather than a serious pest. Humans may not spend their entire lives among the mangrove trees, but they are still part of the system. Many of Thailand's mangrove ecosystems are under the government's protection as parks or nature reserves. That ensures that everyone can get a chance to enjoy the environment and learn about its unique qualities. Scientists are still learning more about these regions, and tourists get a chance to see the unique sights and learn more about the way that nature works. A trip into the mangroves is a unique opportunity, and one that brings enough joy to people that they will always want to protect the region. It is simple another type of symbiosis! 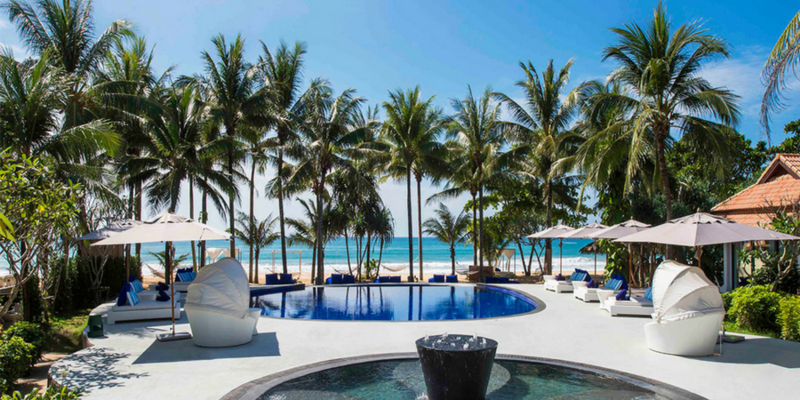 This unique beach resort near Phang Nga Bay offers 59 rooms, suites and unique villas featuring generous living spaces, state-of-the-art facilities and branded amenities, with the powder white sand of Natai Beach literally on your doorstep and Phuket’s most alluring beach club close at hand. As part of the resorts experiences you can explore the gorgeous Phang Nga Bay that is speckled with stunning deserted beaches, a spectacular limestone island, and the hidden emerald green lagoons. You can spend the better half of the morning exploring limestone peaks at the James Bond Island. Wonder though and explore the mangroves, crystal and Lagoon caves. During mealtimes, Akyra's recreation team brings your meals on board to make sure you enjoy the magical experience all day long. If you want to temporarily escape from the pressures and stresses of your modern existence, there's probably no better place on this planet than Phang Nga.